The musculoskeletal system provides form, support, stability, and movement to the body. The skeleton, muscles, cartilage, tendons, ligaments, joints, and other connective tissues are all part of the musculoskeletal system, which work together to provide the body with support, protection, and movement. The bones of the skeletal system protect the body’s internal organs, support the weight of the body, and serve as the main storage system for calcium and phosphorus. The muscles of the muscular system keep bones in place; they assist with movement by contracting and pulling on the bones. To allow motion, different bones are connected by joints which are connected to other bones and muscle fibers via connective tissues such as tendons and ligaments. Cartilage prevents the bone ends from rubbing directly on each other. Malnutrition and arthritis are examples of disorders and diseases in the body that can severely impair the function of the musculoskeletal system. The musculoskeletal system provides support to the body and gives humans (and many animal species) the ability to move. The body’s bones (the skeletal system), muscles (muscular system), cartilage, tendons, ligaments, joints, and other connective tissue that supports and binds tissues and organs together comprise the musculoskeletal system. Most importantly, the system provides form, support, stability, and movement to the body. For example, the bones of the skeletal system protect the body’s internal organs and support the weight of the body. The skeletal portion of the system serves as the main storage depot for calcium and phosphorus. It also contains critical components of the hematopoietic system (blood cell production). The muscles of the muscular system keep bones in place; they also play a role in movement of the bones by contracting and pulling on the bones, allowing for movements as diverse as standing, walking, running, and grasping items. To allow motion, different bones are connected by joints. Within these joints, bones are connected to other bones and muscle fibers via connective tissue such as tendons and ligaments. Cartilage prevents the bone ends from rubbing directly on each other. Muscles contract (bunch up) to move the bone attached at the joint. Joints, tendons, and ligaments: To allow motion, different bones are connected by joints. Within these joints, bones are connected to other bones and muscle fibers via connective tissue such as tendons and ligaments. Human muscular system: The muscles of the muscular system keep bones in place while assisting with movement by contracting and pulling on the bones. Unfortunately, diseases and disorders that may adversely affect the function and overall effectiveness of the system exist and can be detrimental to the body. These potentially debilitating diseases can be difficult to diagnose due to the close relation of the musculoskeletal system to other internal systems. In humans, the most common musculoskeletal diseases worldwide are caused by malnutrition. Ailments that affect the joints, such as arthritis, are also widespread. These can make movement difficult; in advanced cases, they completely impair mobility. In severe cases in which the joint has suffered extensive damage, joint replacement surgery may be needed. Human skeletal system: The bones of the skeletal system protect the body’s internal organs, support the weight of the body, and serve as the main storage system for calcium and phosphorus. Progress in the science of prosthesis design has resulted in the development of artificial joints, with joint replacement surgery in the hips and knees being the most common. Replacement joints for shoulders, elbows, and fingers are also available. Even with this progress, there is still room for improvement in the design of prostheses. The state-of-the-art prostheses have limited durability, wearing out quickly, particularly in young or active individuals. Current research is focused on the use of new materials, such as carbon fiber, that may make prostheses more durable. Prostheses: Improvements in the design of prostheses, artificial replacements for body parts such as joints, elbows, legs, and fingers, have allowed for a wider range of activities in impaired recipients. The hydrostatic skeleton, exoskeleton, and endoskeleton support, protect, and provide movement to the bodies of different types of animals. In organisms with hydrostatic skeletons, the muscles contract to change the shape of the coelom, which then produces movement due to the pressure of the fluid inside the fluid-filled cavity. Exoskeletons are external skeletal systems that are made up of chitin and calcium carbonate. Organisms with an endoskeleton are supported by a hard, mineralized skeletal system that resides inside the body. In vertebrates, the endoskeleton system is further divided into the axial skeleton and appendicular skeleton. A skeletal system is necessary to support the body, protect internal organs, and allow for the movement of an organism. There are three different skeleton designs that provide organisms these functions: hydrostatic skeleton, exoskeleton, and endoskeleton. 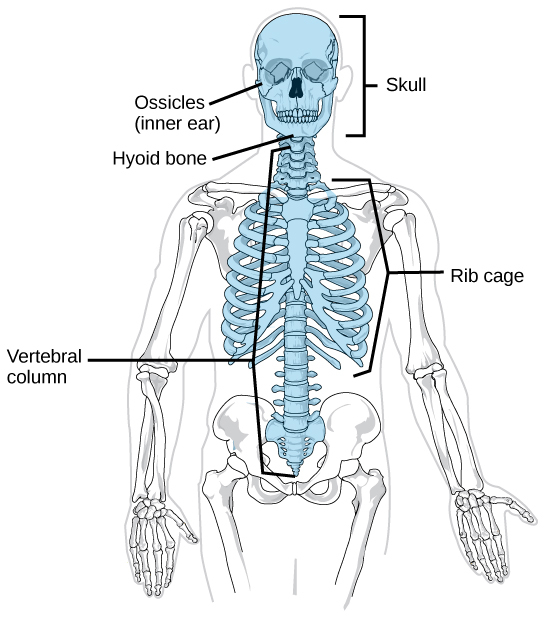 A hydrostatic skeleton is one formed by a fluid-filled compartment within the body: the coelom. The organs of the coelom are supported by the aqueous fluid, which also resists external compression. This compartment is under hydrostatic pressure because of the fluid and supports the other organs of the organism. This type of skeletal system is found in soft-bodied animals such as sea anemones, earthworms, Cnidaria, and other invertebrates. 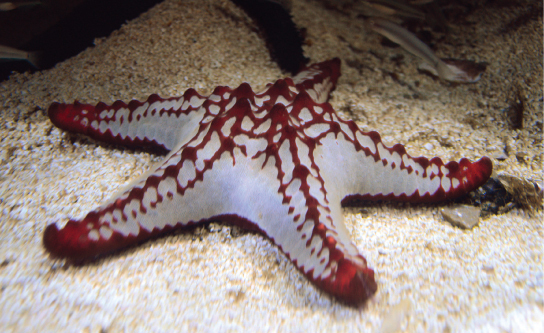 Hydrostatic skeleton: The skeleton of the red-knobbed sea star (Protoreaster linckii) is an example of a hydrostatic skeleton. Movement in a hydrostatic skeleton is provided by muscles that surround the coelom. The muscles in a hydrostatic skeleton contract to change the shape of the coelom; the pressure of the fluid in the coelom produces movement. For example, earthworms move by waves of muscular contractions (peristalsis) of the skeletal muscle of the body wall hydrostatic skeleton, which alternately shorten and lengthen the body. Lengthening the body extends the anterior end of the organism. Most organisms have a mechanism to fix themselves in the substrate. Shortening the muscles then draws the posterior portion of the body forward. Although a hydrostatic skeleton is well-suited to invertebrate organisms such as earthworms and some aquatic organisms, it is not an efficient skeleton for terrestrial animals. An exoskeleton is an external, hard, encasement on the surface of an organism. For example, the shells of crabs and insects are exoskeletons. This skeleton type provides defense against predators, supports the body, and allows for movement through the contraction of attached muscles. As with vertebrates, muscles must cross a joint inside the exoskeleton. Shortening of the muscle changes the relationship of the two segments of the exoskeleton. Arthropods, such as crabs and lobsters, have exoskeletons that consist of 30–50 percent chitin, a polysaccharide derivative of glucose that is a strong-but-flexible material. Chitin is secreted by the epidermal cells. The exoskeleton is further strengthened by the addition of calcium carbonate in organisms such as the lobster. Because the exoskeleton is acellular and does not grow as the organism grows, arthropods must periodically shed their exoskeletons. 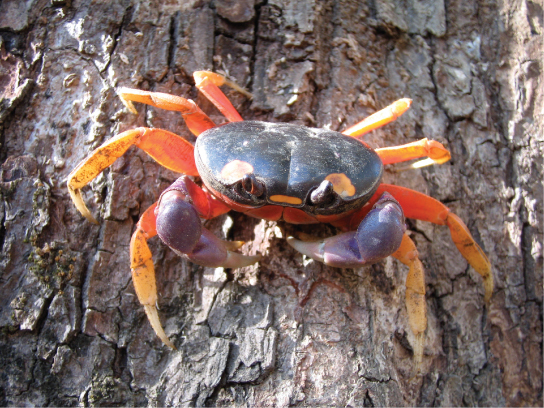 Exoskeletons: Muscles attached to the exoskeleton of the Halloween crab (Gecarcinus quadratus) allow it to move. An endoskeleton consists of hard, mineralized structures located within the soft tissue of organisms. An example of a primitive endoskeletal structure is the spicule of sponges. The bones of vertebrates are composed of tissues, whereas sponges have no true tissues. Endoskeletons provide support for the body, protect internal organs, and allow for movement through contraction of muscles attached to the skeleton. 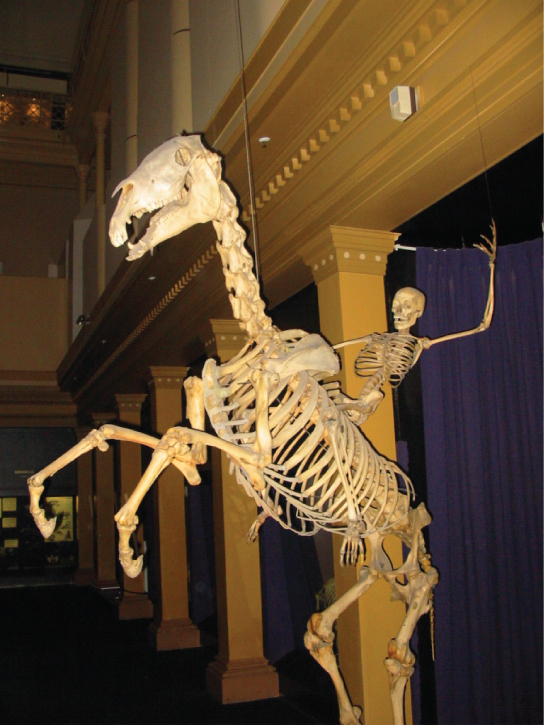 Endoskeletons: The skeletons of humans and horses are examples of endoskeletons. They provide bodies with support, protection of organs, and aid in movement. The axial skeleton forms the central axis of the human body and consists of the skull, vertebral column, and thoracic cage. The axial skeleton provides support and protection for the brain, spinal cord, and the organs in the ventral body cavity; it also provides a surface for the attachment of muscles, directs respiratory movements, and stabilizes portions of the appendicular skeleton. The bones of the skull are divided into cranial bones and facial bones; their main roles consist of supporting the structures of the face and protecting the brain. The vertebral column protects the spinal cord, supports the head, and acts as an attachment point for the ribs and muscles of the back and neck. The thoracic cage’s most notable role is in breathing; however, it also protects the organs of the thoracic cavity, provides support for the shoulder girdles and upper limbs, and functions as the attachment point for the diaphragm, muscles of the back, chest, neck, and shoulders. The axial skeleton forms the central axis of the human body and includes the bones of the skull, the ossicles of the middle ear, the hyoid bone of the throat, the vertebral column, and the thoracic cage (ribcage). The function of the axial skeleton is to provide support and protection for the brain, spinal cord, and organs in the ventral body cavity. It also provides a surface for the attachment of muscles that move the head, neck, and trunk; performs respiratory movements; and stabilizes parts of the appendicular skeleton, which will be discussed later. Axial skeleton: The axial skeleton consists of the bones of the skull, ossicles of the middle ear, hyoid bone, vertebral column, and rib cage. The bones of the skull support the structures of the face and protect the brain. The skull consists of 22 bones, which are divided into two categories: cranial bones and facial bones. The cranial bones are eight bones that form the cranial cavity, which encloses the brain and serves as an attachment site for the muscles of the head and neck. The eight cranial bones include the frontal bone, two parietal bones, two temporal bones, the occipital bone, the sphenoid bone, and the ethmoid bone. Skull: The bones of the skull support the structures of the face and protect the brain. Fourteen facial bones form the face, provide cavities for the sense organs (eyes, mouth, and nose), protect the entrances to the digestive and respiratory tracts, and serve as attachment points for facial muscles. 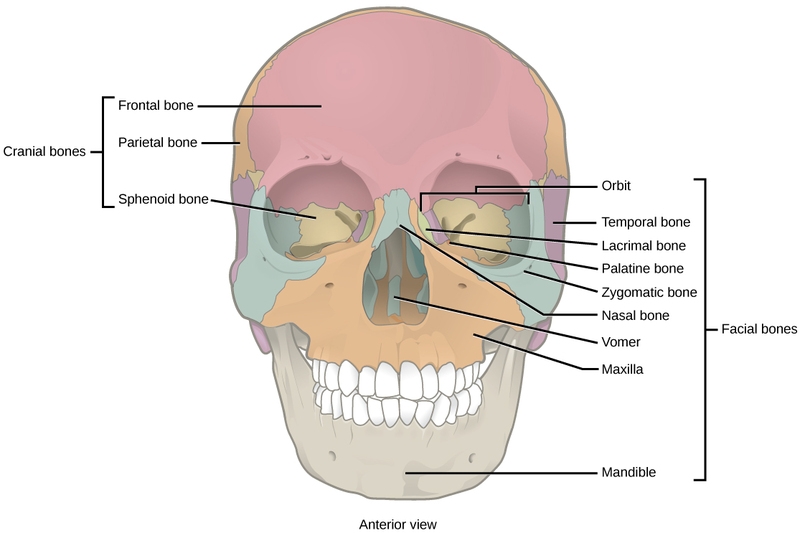 The 14 facial bones are the nasal bones, maxillary bones, zygomatic bones, palatine, vomer, lacrimal bones, inferior nasal conchae, and mandible. 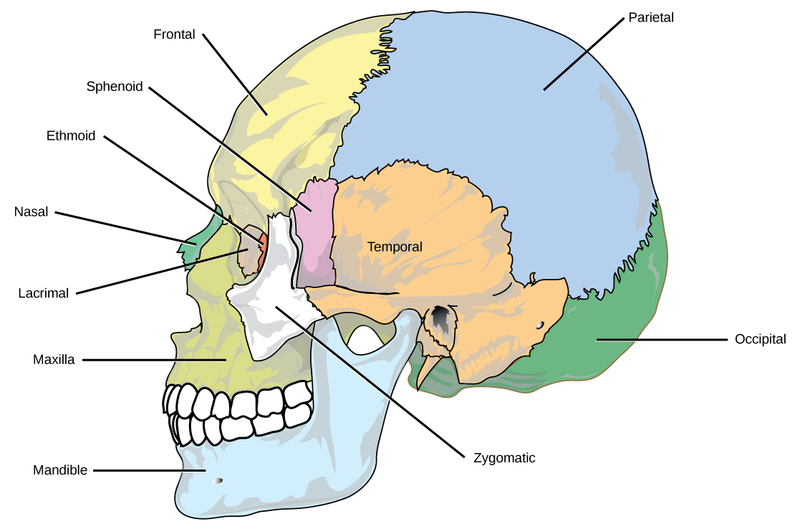 Cranial and facial bones: The facial bones of the skull form the face and provide cavities for the eyes, nose, and mouth. The cranial bones, including the frontal, parietal, temporal, occipital, ethmoid, and sphenoid bones. The auditory ossicles of the middle ear transmit sounds from the air as vibrations to the fluid-filled cochlea. The auditory ossicles consist of six bones: two malleus bones, two incus bones, and two stapes, one of each on each side. These bones are unique to mammals. The hyoid bone lies below the mandible in the front of the neck. It acts as a movable base for the tongue and is connected to muscles of the jaw, larynx, and tongue. The mandible articulates with the base of the skull, controling the opening to the airway and gut. In animals with teeth, the mandible brings the surfaces of the teeth in contact with the maxillary teeth. The vertebral column, or spinal column, surrounds and protects the spinal cord, supports the head, and acts as an attachment point for the ribs and muscles of the back and neck. 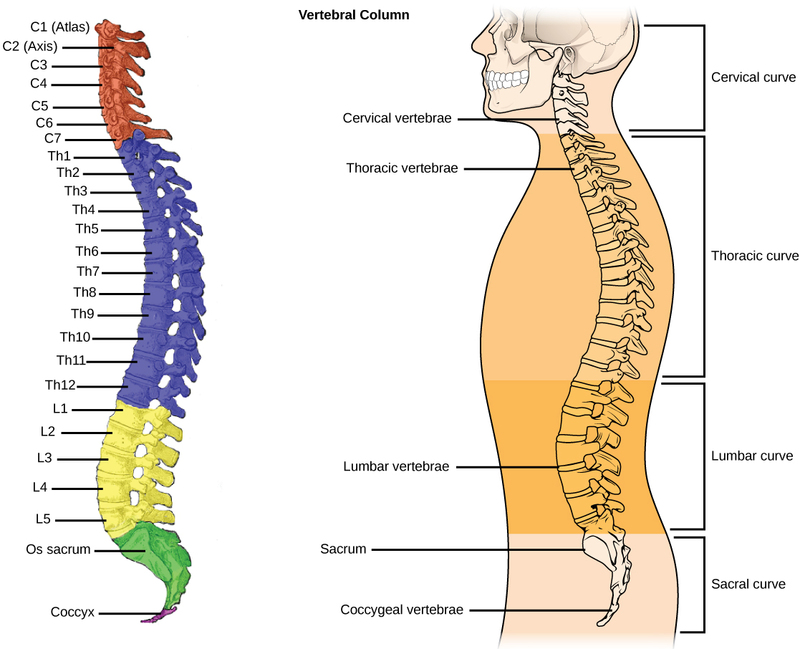 The adult vertebral column is comprised of 26 bones: the 24 vertebrae, the sacrum, and the coccyx bones. In the adult, the sacrum is typically composed of five vertebrae that fuse into one. We begin life with approximately 33 vertebrae, but as we grow, several vertebrae fuse together. The adult vertebrae are further divided into the 7 cervical vertebrae, 12 thoracic vertebrae, and 5 lumbar vertebrae. Vertebral column: (a) The vertebral column consists of seven cervical vertebrae (C1–7), twelve thoracic vertebrae (Th1–12), five lumbar vertebrae (L1–5), the sacrum, and the coccyx. (b) Spinal curves increase the strength and flexibility of the spine. Each vertebral body has a large hole in the center through which the nerves of the spinal cord pass. There is also a notch on each side through which the spinal nerves, which serve the body at that level, can exit from the spinal cord. The names of the spinal curves correspond to the region of the spine in which they occur. The thoracic and sacral curves are concave, while the cervical and lumbar curves are convex. The arched curvature of the vertebral column increases its strength and flexibility, allowing it to absorb shocks like a spring. Intervertebral discs composed of fibrous cartilage lie between adjacent vertebral bodies from the second cervical vertebra to the sacrum. Each disc is part of a joint that allows for some movement of the spine, acting as a cushion to absorb shocks from movements, such as walking and running. Intervertebral discs also act as ligaments to bind vertebrae together. The inner part of discs, the nucleus pulposus, hardens as people age, becoming less elastic. This loss of elasticity diminishes its ability to absorb shocks. The thoracic cage, also known as the ribcage, is the skeleton of the chest. It consists of the ribs, sternum, thoracic vertebrae, and costal cartilages. The thoracic cage encloses and protects the organs of the thoracic cavity, including the heart and lungs. It also provides support for the shoulder girdles and upper limbs, and serves as the attachment point for the diaphragm, muscles of the back, chest, neck, and shoulders. Changes in the volume of the thorax enable breathing. 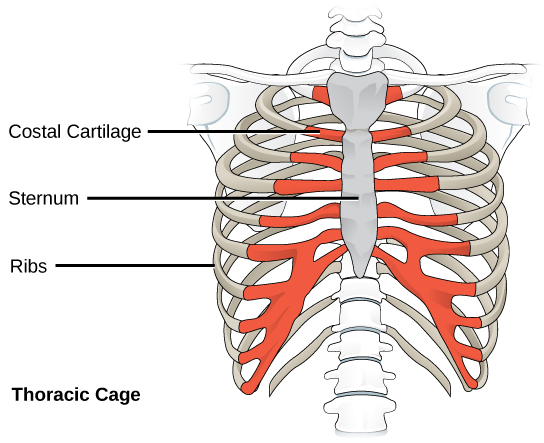 Thoracic cage: The thoracic cage, or rib cage, protects the heart and the lungs. The appendicular skeleton supports the attachment and functions of the upper and lower limbs of the human body. The human appendicular skeleton is composed of the bones of the upper limbs, the lower limbs, the pectoral girdle, and the pelvic girdle. The pectoral girdle acts as the point of attachment of the upper limbs to the body. The upper limb consists of the arm, the forearm, and the wrist and hand. 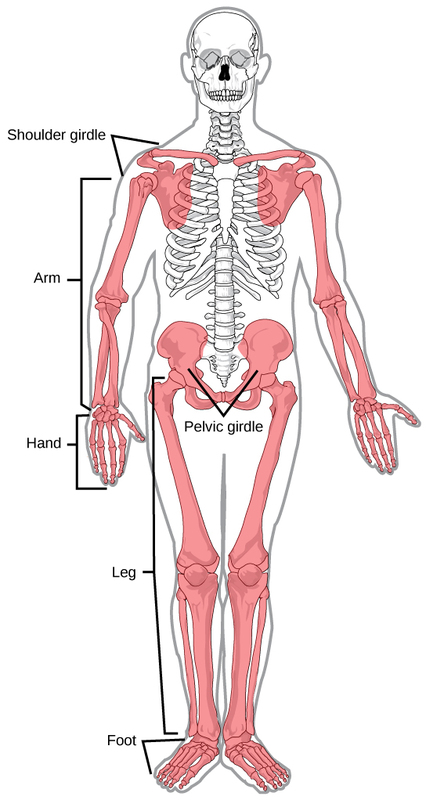 The pelvic girdle is responsible for bearing the weight of the body and is responsible for locomotion; it is also responsible for attaching the lower limbs to the body. The lower limbs, including the thighs, legs, and feet, support the entire weight of the body and absorb the resulting forces from locomotion. The human appendicular skeleton is composed of the bones of the upper limbs (which function to grasp and manipulate objects) and the lower limbs (which permit locomotion). It also includes the pectoral (or shoulder) girdle and the pelvic girdle, which attach the upper and lower limbs to the body, respectively. Appendicular skeleton: The appendicular skeleton is composed of the bones of the pectoral limbs (arm, forearm, hand), the pelvic limbs (thigh, leg, foot), the pectoral girdle, and the pelvic girdle. The pectoral girdle bones, providing the points of attachment of the upper limbs to the axial skeleton, consists of the clavicle (or collarbone) in the anterior, as well as the scapula (or shoulder blades) in the posterior. The clavicles, S-shaped bones that position the arms on the body, lie horizontally across the front of the thorax (chest) just above the first rib. Pectoral girdle: (a) The pectoral girdle in primates consists of the clavicles and scapulae. (b) The posterior view reveals the spine of the scapula to which muscle attaches. The scapulae are flat, triangular bones that are located at the back of the pectoral girdle. They support the muscles crossing the shoulder joint. The spine runs across the back of the scapula; it is a good example of a bony protrusion that facilitates a broad area of attachment for muscles to bone. The upper limbs contain 30 bones in three regions: the arm (shoulder to elbow), the forearm (ulna and radius), and the wrist and hand. The humerus is the largest and longest bone of the upper limb and the only bone of the arm. It articulates (joins) with the scapula at the shoulder and with the forearm at the elbow. The forearm, extending from the elbow to the wrist, consists of two bones: the ulna and the radius. The radius, located along the lateral (thumb) side of the forearm, articulates with the humerus at the elbow. The ulna, located on the medial aspect (pinky-finger side) of the forearm, is longer than the radius. It articulates with the humerus at the elbow. 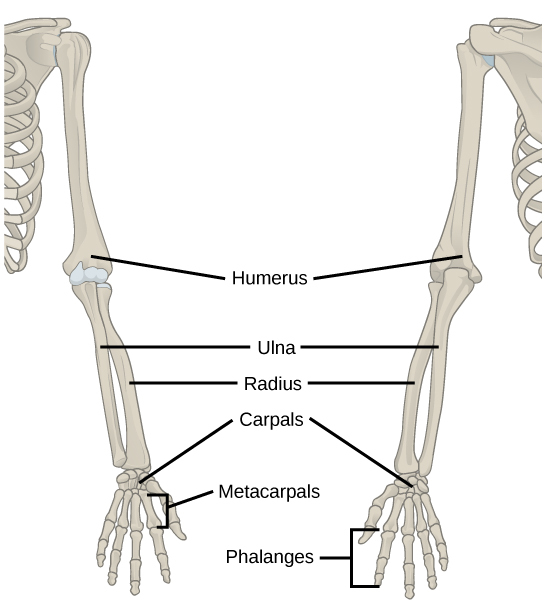 The radius and ulna also articulate with the carpal bones and with each other, which in vertebrates enables a variable degree of rotation of the carpus with respect to the long axis of the limb. The hand includes the eight bones of the carpus (wrist), the five bones of the metacarpus (palm), and the 14 bones of the phalanges (digits). Each digit consists of three phalanges, except for the thumb, which, when present, has only two. Upper limb: The upper limb consists of the humerus of the upper arm, the radius and ulna of the forearm, eight bones of the carpus, five bones of the metacarpus, and 14 bones of the phalanges. The pelvic girdle attaches to the lower limbs of the axial skeleton and is responsible for bearing the weight of the body and for locomotion. It is securely attached to the axial skeleton by strong ligaments. It also has deep sockets with robust ligaments to securely attach the femur to the body. The pelvic girdle is further strengthened by two large hip bones. In adults, the hip bones are formed by the fusion of three pairs of bones: the ilium, ischium, and pubis. The pelvis joins together in the anterior of the body the pubic symphysis joint and with the bones of the sacrum at the posterior of the body. The lower limbs consists of the thigh, the leg, and the foot. The bones of the lower limb are the femur (thigh bone), patella (kneecap), tibia and fibula (bones of the leg), tarsals (bones of the ankle), and metatarsals and phalanges (bones of the foot). The bones of the lower limbs are thicker and stronger than the bones of the upper limbs because of the need to support the entire weight of the body along with the resulting forces from locomotion. 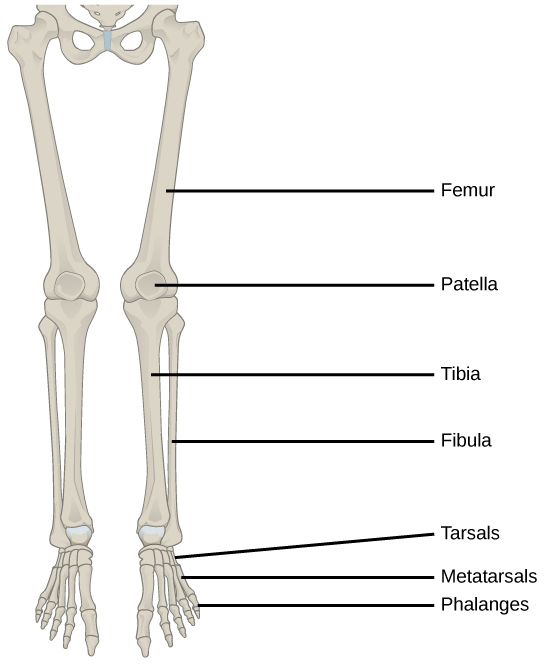 Lower limb: The lower limb consists of the thigh (femur), kneecap (patella), leg (tibia and fibula), ankle (tarsals), and foot (metatarsals and phalanges) bones. The femur, or thighbone, is the longest, heaviest, and strongest bone in the body. The femur and pelvis form the hip joint at the proximal end. At the distal end, the femur, tibia, and patella form the knee joint. 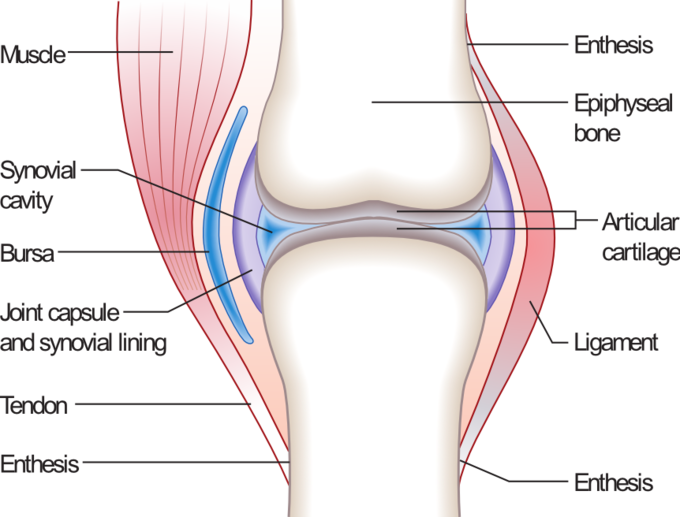 The patella, or kneecap, is a triangular bone that lies anterior to the knee joint; it is embedded in the tendon of the femoral extensors (quadriceps). It improves knee extension by reducing friction. The tibia, or shinbone, is a large bone of the leg that is located directly below the knee. The tibia articulates with the femur at its proximal end, with the fibula and the tarsal bones at its distal end. As the second largest bone in the human body it is responsible for transmitting the weight of the body from the femur to the foot. The fibula, or calf bone, parallels and articulates with the tibia. It is not weight-bearing, but acts as a site for muscle attachment while forming the lateral part of the ankle joint. The tarsals are the seven bones of the ankle, which transmits the weight of the body from the tibia and the fibula to the foot. The metatarsals are the five bones of the foot, while the phalanges are the 14 bones of the toes. Foot and ankle: This drawing shows the bones of the human foot and ankle, including the metatarsals and the phalanges.